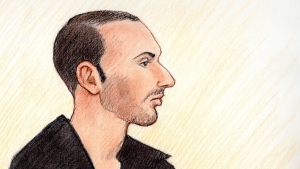 René Goudreau in a court sketch done in November 2012. A 30-year-old Ottawa man set fire to a Bayshore apartment while his mother, who used a wheelchair, was inside in November 2012, a jury found Tuesday as he was found guilty of first-degree murder. Lucie Goudreau, 53, had multiple sclerosis, a degenerative disease that causes nerves in the brain and spinal cord to deteriorate. René Goudreau was initially found unfit to stand trial in January 2013, following a psychiatric assessment. At the time, a Royal Ottawa Mental Health Centre psychiatrist found that Goudreau did not understand the first-degree murder charge against him or the court process, meaning he was unable to guide his lawyer on how to proceed with the case. Following another 60-day psychiatric assessment, Goudreau was again deemed unfit to stand trial in March 2013. His trial began at the end of September 2015, after he was found fit to stand trial. He is now 33.